A little bit of science today but hopefully one that's interesting. 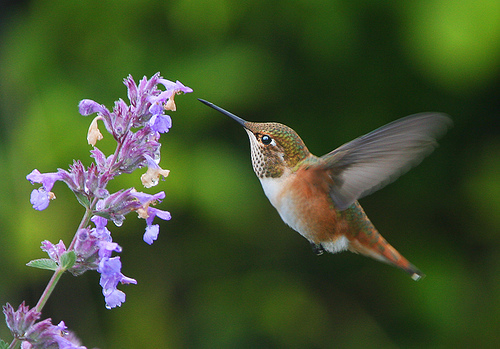 Ever wonder how hummingbirds float on air hovering around flowers in search of nectar, much like insects and bugs do? That's because they pretty much fly the same way. Well, almost. Hummingbirds pull off their aerial antics by flying more like insects than their fellow birds. Most birds only produce lift in the downward flap, i.e. their wings are drawn towards their body on the upstroke. But the hummingbird, by flipping its wing before it flaps upwards, can create lift in both directions. 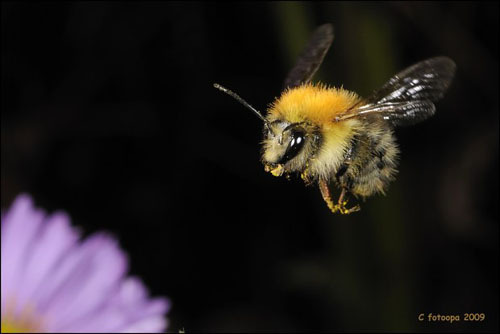 Insects do the same thing but doing so at different percentage of downstroke/upstroke lifting ratio. The lift on hummingbirds is obtained from 75% downstroke and 25% upstroke. For all other birds, the lift is 100% downstroke. In comparison, bugs get theirs from 50%-50% up and downstroke. How do hummingbirds flip their wings since they have bones, unlike insects? Biologists say they twist their wrists before each upstroke. Ouch! I can't take twisting my wrist 140 degree before every movement. Madness, that would be awfully painful. Fascinating information, especially after so many hours observing hummingbirds on our recent trip to Costa Rica. I will now look at my photos again...and with a new appreciation for these remarkable creatures. You have a lively one this time. tehr - harga dslr sangat berpatutan skrg, bro!